At this day and age, “Just Another Toothbrush” won’t cut it. People want the very best when it comes to countering cavities, gingivitis, tartars, and plaques. People might have different tastes when it comes to manual and electric toothbrushes. Yet, there are some who’ve grown weary about the latter and are seeking alternatives. Recharging the electric kind every half hour is a pain in the bum. Plus, people tend to forget about small things we call, “Chargers.” You can’t even replace them with a new one. If you want to ditch the costly version but not the performance, go for brushes with batteries. Don’t just settle for “Any” model. Pick the best battery operated toothbrush there is. Quit rolling your eyes out! I’m here to help with a bunch of choices and a buying guide among other things. Let’s kick this off with “Other Things” first. How I Tumbled On to These Models? I’m not the kind of guy who’d design this post out of a whim. These tiny yet powerful tooth polishers have their benefits. You might have guessed a few. Let me fill you in on the rest of the pack. Hey! These Will Cost You Less Bucks! High-End brushes have electric ports that connect the inside motor with a power source. We brush, wash, recharge, and repeat. The motor inside requires being functioning and robust. A significant portion of the motor’s price goes into ensuring that. Their Battery-Powered cousins need the battery and a DC motor that’s dependent on the battery. I have to be honest with you, they are not as good as the higher-ups are. Hence, the low price. But there are good products among these models (cue: the list). But battery operated models will cost you more than manual ones. Battery-dependent models often spin or vibrate. These are movement patterns a normal brush wouldn’t even get close to. Our hands aren’t efficient enough. This little trick allows these devices to move to places where manual ones won’t be able to reach. That’s why people can remove at least four times (some claim a greater number) the plaque their ancestors can. These Are Comfortable (And Quick)! I’m not shoving this on you. I know, individual comfort zone differs from person to person. From what I experienced, battery-powered models are more sensitive to pressure, the time it takes to brush properly, and bristle quality. That’s why users get to have comforting experience. Also, greater sensitivity toward these features allows the brush to be flexible in case of the control system. One gets to choose from different modes, bristle types, batteries, and head sizes as well. Battery Dependent Brushes Are Portable! One can basically put these in the side pocket of a backpack and run off to a vacation. Newer models have small brush heads. Also, you can pick them apart when not in use. This saves space by itself. Makers have also put in perks like travel cases. This ensures that the delicate machine inside your tool doesn’t get damaged or toyed with when you tackle an unsurpassable mountain or an unrelenting forest by yourselves. Take my advice, “If you want a certain amount of comfort in your life every time you wake up or go to bed (or even in between), get a battery-powered tooth polisher (AKA toothbrush). Before you go on a rant about “Where to find one,” let me point you to the top 10 models that fit the bill and help you chill. When it comes to battery-operated toothbrushes, there are different features that each brand advocates for. This is directly proportionate to how much money you are putting into your purchase. If you are into cheap products, this one is a perfect choice there can be. This is an Oral-B product that reaches deep into the nooks and crannies of your teeth. Don’t worry, you can recharge the batteries and the Brush head once these get worn out. The best thing is, people won’t have to shop for batteries immediately. The makers already included that with the package. Once you run out of the replacement batteries too, go for the AA batteries to couple with this product. Do I love the brush head? Yes, I do! The bristles are specifically designed to reach most difficult areas of your mouth. The makers call the cleaning process “Tooth-to-Tooth Cleaning.” Essentially, you get to clean your teeth and everything in between. What if I can’t find a suitable brush head for this device? The answer: You will! This is one product that can work with all the brush heads that Oral-B has up its sleeves. These brush heads include Oral-B Gum Care, Cross Action, FlossAction, and 3D White are few of the brush heads out of many that are compatible with this thing. Enough with the technical mumbo-jumbo! Let’s get into the part where I discuss which dental conditions is this product good for. If you have gum problems and a sensitive set of teeth, this product is just the perfect one for your hygiene. Not to mention, it cleans plaques and tartars as well. Worried about your dentist? Don’t be! Oral-B brushes are “Dentist-Approved” and foolproof when it comes to malfunctions and physical damages. I love the nifty price set by the makers; it corresponds with the performance level. You can use any brush head (regardless of the type) from the makers at Oral-B with this thing. It is quite famous for it’s tooth-to-tooth cleaning action and how quick it operates. Pro-Health Brush comes with the batteries. When buying replacements, AA sized batteries will do. Dentists are fond of the device and recommend it to all of their patients worldwide. Battery chamber is near about exposed. Water can seep inside and affect the batteries. Panasonic doesn’t lag behind when it comes to putting one out in the leagues of “Best Battery Powered Toothbrush.” One thing good about the EW-DS90-S is its size. Oral-B’s lower end toothbrushes can give you a limited number of brush strokes. Yet, this one dishes out 16000 per minute to make cleaning teeth easier. Am I being giddy? To a certain extent, yes. Why wouldn’t I be? Panasonic EW-DS90-S has a sleek wand to go with an amazing brush head (more on that later). The entire package is washable. You have a sleek cap that serves as a storage space. It comes good when anyone is traveling with this product in the package. The bristles are what lured me into buying this product and trying it out for a review. You have 3-edge design at play here. Perhaps, “ZigZag” pattern will ring a bell? This pattern helps to draw out and clean bacteria, plaques, and yellow stains off your teeth. The flat ones clean the surface. Fine bristles go in between cracks. If you want something that can clean the gum and your teeth, well, that’s what the “Extra Fine” bristles are for. And no, my gums didn’t bleed when I used this piece of tech. Another cool thing is, you can replace the brush heads without any fuss. The EW-DS90-S’ head can be swapped with those of WEW057W and WEW0965W. 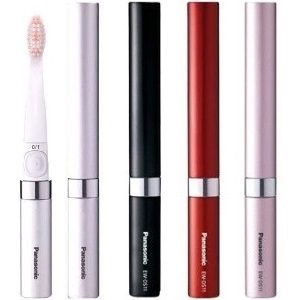 Being a battery operated toothbrush, Panasonic EW-DS90-S produces sound while it goes about cleaning my teeth. But it is not “Super Loud.” In fact, this thing makes the sound of up to 37dB only. It is manageable. People will get a fancy travel case with this sleek-looking toothbrush. One good thing about battery toothbrushes is that they don’t consume electricity. Want a thorough cleaning of the inside part of your mouth and teeth? Triple-edge brush head is here. Don’t worry, this toothbrush is completely washable unlike few of the other alternatives. This little thing hardly makes any noises; you won’t be able to hear a thing while operating. The bristles can cause some amount of discomfort inside your mouth. The small size may prove to be difficult to grip for people with larger hands. I must admit, I am a fan of Oral-B. Don’t blame me… The products they put on the show, are awesome, to say the least! When it comes to 3D White Advanced Vivid Toothbrush, Oral-B gave it their heart. Yes, the design and features are great. But the fact that I could get two brushes in a pack, was the dealmaker for me. 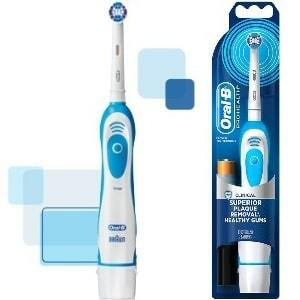 Speaking of the features, Oral-B Pulsar vibrates to mimic the actions of a manual toothbrush. I didn’t have to wiggle my fingers up, down, back, and forth to operate it. The vibration itself wasn’t overwhelming. Instead, I felt someone was gently massaging my teeth. The plaques were just gone! The split-head design of the product allows it to control pressure. No matter how tightly you grip the brush and how much pressure goes into the gripping, the teeth won’t feel the brunt of it. Furthermore, the design allows it to adapt to the shape of your teeth. The bristles are designed to get in between people’s teeth. They sweep the plaque and tartars out. Thanks to the “Split-head” design I spoke of; you can eat all the foods you want. Just don’t forget to brush regularly. Many battery-operated toothbrush makers tell you to go and get the battery from somewhere else. But not Oral-B. These guys pack in the replacement batteries as well. But these things are not available with travel cases. Also, don’t use these in case of children under 3 years of age. These brushes last for a lifetime (one year to be exact) even you brush daily. 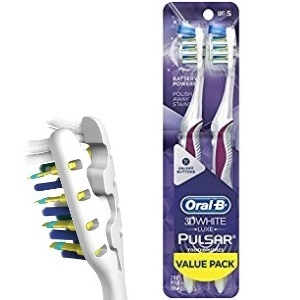 Pulsar is one of the best battery Operated Toothbrush models due to the pulsating technology used in the making. The “Split Head” allows this product to clean your teeth and gum simultaneously without an itch. 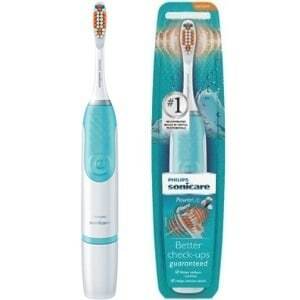 This design also allows the brush to control the amount of pressure it’s putting on your teeth. The pack comes with a set of replacement batteries as well to lessen the hassle. 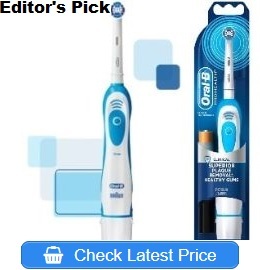 You can’t change the brush heads with this variety of pulsating toothbrush from Oral-B. 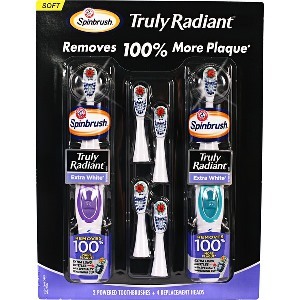 Why would I include SpinBrush Truly Radiant Extra White into my stack of best battery powered toothbrush models? Plain and Simple! This little product walks the walk and talks the talk. When it comes to removing plaques, the makers claim that this nifty thing can remove up to 100% more plaques than those manual toothbrushes. I did try and test the theory once. As it turns out, this model is certainly an improvement over its manual counterparts. How So? Well, you have three types of bristles to thank for that. Firstly, there’re the elongated bristles. These provide greater and deeper reach and in turn, great cleaning experience. Then you have the whitening bristles that polish your teeth by removing surface bacteria and stain. There’s a “Whitening Cup” in place at the second half of the brush head. Makers put that in place to help the brush in holding toothpaste in place longer to clean your teeth. The SpinBrush product is compact. You don’t need a lot of space to fit it in. It is travel-friendly and has a nice shape that fits into a minimal space of any travel backpack. Just to let you know, you need AA-size batteries to operate this tiny machine. You need to buy two batteries of the said size as replacements. The originals are long-running too. One can expect the pair to have the juice to run for 6 to 8 weeks depending on how many time he/she brushes. I do like the rotary design of this product; it spins to provide the comprehensive cleaning I need. Makers mention that the brush head is “Dual Action.” It cleans and whitens the teeth. Different parts of the brush make can be split up to change brush head or batteries. Two AA-size batteries are perfect for operation and they last long when you put them to the test. The price is very much affordable when I compare it to other popular brands. You won’t find a travel case with this little brush for ease of carrying. To be honest. I don’t know what it is between me and sonic toothbrushes. Waterpik Nano Sonic makes it two in today’s list. With 16,000 strokes per minute, this little product just makes it into the realm of Sonic toothbrushes. Also, this many strokes gently clean your teeth without you stressing out too much. However, I must mention that the manufacturers don’t claim this “Gear” to be sonic in any way. One thing I can guarantee you guys is that this is strong stuff. It won’t come apart even if people drop it from a considerable height by accident. Have you ever wondered if you could have control over the pressure you apply to your teeth? 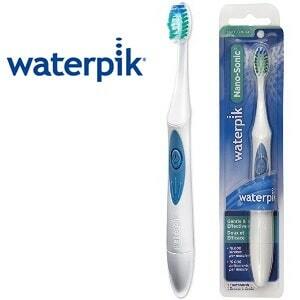 Waterpik grants you that control with high and low bristles at play. Depending on where one is with his/her teeth, he/she can use these bristle sizes ls to make brushing a breeze! How? Well, the long brushes have extended reach that can go in between teeth. I find it easy to brush in the gap between my gums and teeth. These bristles hunt bacteria like crazy. There are short ones as well. They polish people’s teeth, unlike their counterparts. It is a “Two-Part” solution. As far as batteries go, you need AAA-size ones for the job. One should be good enough. The first pair comes with the package itself. However, you’d need to buy the replacements. Oh, yeah, these batteries are replaceable. I loved how low Waterpik priced this product. Cleaning it is not a fuss either. You get to put it under water. This Nano Sonic toothpaste behaved perfectly even when I submerged it under water. This is one product which is sturdy and durable despite hanging low in terms of price. AAA batteries run for a good period of time ( 1.5 to 2 months) and replacements are easy to find. Different bristle types effortlessly cater to different areas of your mouth and their cleaning. The on off buttons make controlling this stuff easier than anyone would think. It is water resistant. So, cleaning it under running water isn’t such a problem as people make it. Few of the users mentioned in reviews that for some reason this Waterpik device develops corrosion over time. As I move to the penultimate product on my list of best battery operated toothbrush choices, I’m gonna give this one to the kids. The adorable little angels, the toddlers deserve the best in the world. Little Man’s knows this and went all out to deliver a product that caters to these youngsters with utmost care. First of all, these guys got their electric brush approved by the FDA. So, you KNOW that this is quality stuff. 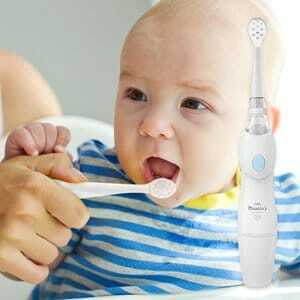 With nylon brush heads (Yes, I said brush heads), your toddler won’t feel a thing when you are brushing his/her teeth. Just a gentle vibration. While we’re on the topic of vibration, I must admit that this DuPont device vibrates 16,000 times per minute. These vibrations are gentle to your kid’s mouth. The silicone brush head doesn’t trouble him at all. Also, there’s an “Interval Vibration System” at play. It signals parents when to brush the other side. Don’t worry about the battery consumption at all! This DuPont brush has an “Auto-Shutoff” mode. The brush stops altogether when people are done with 2-minute brushing. While we’re on the point of “Saving.” This amazing accessory comes with replacement heads to save you some bucks. Handy! DuPont brushes use silicon to come up with the heads. These heads are gentle with our little ones. When it massages their gums, they’ll hardly feel a thing. Operating it is simpler than you might think. Also, the AAA batteries stay good for 120 days before one needs to change them. That’s “IF” one uses it twice-a-day. Funny thing is, there are lights set in the brush that make it noticeable for kids. There’s an LED light that tells you how well the brush is behaving inside your kid’s mouth. People can use this DuPont brush in case of toddlers up to 10-year-old kids. Despite vibrating 16000 times a minute, the brush is gentle thanks to the nylon bristles. The silicon brush head allows your kid to brush comfortably twice a day. LED lights are helpful when you need to know what’s happening inside little ones’ mouths. This little device comes with auto-shutoff and a time-honored alarm system that makes brushing easy. A number of people complained about the brush head coming off easily when they use this thing. I know, many of you are wondering where’s Phillips on my list of Best Battery Powered Toothbrush models. Since it’s the last slot on my list, let’s honor your curiosity a bit. Not solely because “I want to.” Rather for the reason that Phillips HX3631/06 deserves a place on this list. Just like Oral-B, many dentists place their faiths on Phillips too. This 10-inch toothbrush is also referred to as “PowerUp” toothbrush and for good reasons. For one, we get our hands on the Sonic Technology. This helps to drive the toothpaste and additional liquids into tight spots between our gums and teeth. Obviously, it helps the brush to clean plaque better. I can say, it does “More” than your manual toothbrush will ever do. Brushing for two minutes within one session, two sessions a day. That’s all you need to clear out cavities and whiten two sets of teeth. Brushing for 120 seconds (trying to be dramatic here) isn’t hard. Phillips gave HX3631/06 an ergonomic handle. Our hands won’t be tired in any case. “How do you know your two minutes are up?” Good question! There’s a built-in timer that tells you. Also, the timer comes with an “Interval” indicator. The alarm tells people to switch sides of the gums in every thirty seconds. Nifty! Unlike many, Phillips HX3631/06 requires the services of two AA-size batteries. I had my initial supplies taken care of by the makers. It is the same for everybody. I’m sure all kinds of AA batteries will do just fine. However, I found the best response when pairing HX3631/06 with polaroid batteries at hand. This Phillips Sonicare product accepts replacement heads from B01MRQXZF0 and HX3012 models. It has a simplistic yet catchy design that appeals to the young and old alike. You have an ergonomic handle that allows users to be comfortable whenever operating with it. The medium bristles of allow comprehensive teeth cleaning and gum care treatment. It is a well-known brand that covers for plaques, tartar, cavities, and gingivitis. It kind of over-vibrates when you compare it with other models of this franchise. I’d prefer it to be a bit less noisy than it currently is. Hey, I didn’t have a divine vision on my way to the computer and figure out these 7 battery powered toothbrushes. I had to research a bit. Some of my recommendations resulted from my experience. I noticed factors and patterns that are common between my choices and the internet’s. Let me lay them up for you. These tools that I put up for short reviews have motors that are stubborn in nature. These motors can muster up tremendous power levels. With manual toothbrushes, brushing for two minutes can be a stretch. Also, two minutes won’t do as you can’t reach all the areas of your teeth, gum, and mouth. A battery-powered device has a greater range of movement compared to manual ones. Having a strong motor means that they can do the job inside two minutes. With the power and precision these motors deliver, there’s very little room for wasting energy. I am always on the lookout for brushes with soft or “Moderately Soft” bristles. One advantage of having soft bristles is that they can bend and extend their reach easily. The brush won’t feel stiff in your mouth. When people are on the lookout for children’s brushes, they should go for the ones with soft brush heads. This will take better care of their gums and tiny teeth. Hard and stiff bristles are particularly harmful for guys/girls with sensitivity or Periodontitis. Also, make sure you change the brush head inside every three months for hygienic issues. For me, the Best Battery Operated Toothbrush should have different types of bristles. Makers often use “Domed” or “Rippled” types. I am a big fan of the “ZigZag” version as well as you can see from my recommendations. These reach deep and clear out stingy dirt, plaque, and tartar. Small stature (head and body) allow users with average hands to properly grip the brush. I can’t stress on how important it is to have a brush with a small head. These brushes can be maneuvered well through tough spots inside your mouth. These models are lighter than average ones. I advocate smaller brushes for children and the elderly as they have fragile gums and teeth. Children will most likely chew these products. It is important for children’s accessories to be flexible and be of non-toxic materials as well for safety. These Recommendations Have Bigger and More Comfortable Handles than Others! Should I be honest with you? Most of us don’t even care how long the handle is let alone comfort. I chose to go the other way. Bigger handles mean your brush will reach the furthest corner of your mouth. People don’t have to worry about long bristles anymore. Comfortable handle grants you a relaxed posture when going about the task. Exerting too much pressure on the handle can result in people hurting themselves. Ergonomic handle reduces that risk. Cushion under the thumb allows it to relax and move freely as well. It makes the tool feel light. Picking a product for home use is somewhat of a challenge these days. Somehow, people have ended up making it even more challenging in recent days. There are so many “Expert Buying Guides” that introduce you to “Filler” facts than relying on personal experience. I intend to change that when it comes to the best battery operated toothbrush for yourselves, your kids, and the elderly in the house. They deserve better. So do you. As my readers might have guessed, these recommendations represent some of the giants in the dental industry. Brands like Oral-B, Panasonic, and Phillips are among the top three. DuPont takes the cake as far as one for your child is concerned. The models might not be as savvy as their electric cousins. But they are adept at what they do. I’m not being baseless. My buying guide goes into detail about “Why” I made such choices. Have a look while you are at it.